Kalendář pro Symbian, nástupce kalendáře Papyrus. Možná jsem hloupý, ale nebyl by nějaký kód? Turn your Smartphone into a powerful time management system. Enjoy innovative and compelling tools to manage your schedule using advanced views, category coloring and icons far beyond the ability of the default S60 Smartphone tools. * Customize text size, color based on item's characters, item display layout and more! * Full month worth of agenda displayed in one screen! * 20 hour timelines with category colors showing your appointments for each day! * Full task manager solution. 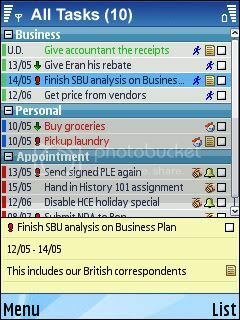 Manager all of your tasks in one view using advanced tools designed especially for professional task management! * Rename filters to match your own needs, such as project names, personal life related filters and more! * Powerful recurrence engine that helps you manage and create recurring appointments of any type! * Full robust task manager built-in as part of the same solution! 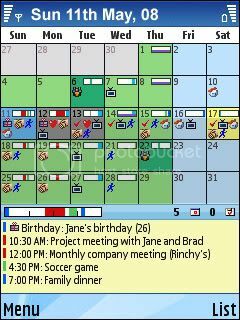 * SBSH Calendar is designed to fulfill all time management needs of the busy professional! What's new in Calendar 1.5? We juiced up the general look of Calendar with shiny new icons and a fresh look. We tried to maximize information while retaining the eye-candy look that SBSH is so famous for. 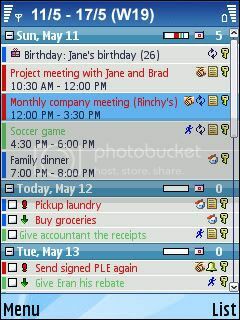 Some more examples include old scrollbars which have been replaced with native Symbian ones to allow for quicker view loading and pave the way for Calendar Touch which is already in the works. The Tasks view was improved upon - selection now works better, there is "round-scrolling" and a new sort option - by "Alarm". Instead of having to rotate through all views to get to a particular view, the user can now click on the View menu to bring up a graphical list of views. The user can press a number directly to select a view, or use the d-pad and action button to select a view. The old way of navigating views still exists and has been made an option for those that would prefer it, but this new navigation method is now the default. The quick view list of appointments and tasks has been moved to the side in monthly view on landscape devices. The database engine has been rewritten from the ground up, providing a dramatic speed improvement. Calendar should start quicker, and you'll see a much more rapid response when navigating between dates. We are also working on implementing even more updates to the engine so that loading time will be ever faster! Calendar now observes creation/changes of items created by the phone's calendar, while SBSH Calendar is running. In addition, it also observes day changes and will update itself accordingly. The Filters system has been redesigned to solve the limitations of the previous versions of Calendar. Every filter has a set of criteria, which can contain a set of Included and categories. Filters can be named and saved in one of eight slots (from the Settings), and are automatically applied when Calendar starts again. Category images, as well as most of the built-in images in Calendar, have been updated for a much nicer display. Category images are now stored under \Data\Others\SBSH\icons as MBM files - which are Symbian resource files. All category images come in two sizes to fit better in different views. Basically, Calendar will show you any icons stored as MBM inside that folder (\low or \high). You can create your own icons using MBMConverter which can be found in the S60 C++ SDK; bmconv.exe under .\Epoc32\Tools in the SDK installation directory. 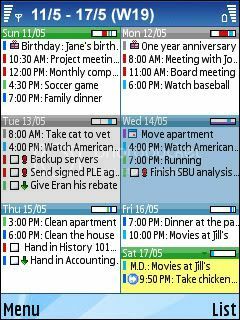 Much time has been put into improving the usability of the recurrence in Calendar. We've tested this quite a bit with beta team so we hope that everything runs smoothly now. If there are any problems that you are experiencing with recurrence - please let us know. A new recurrence type was added, which was asked for by many users - "Repeat Monthly by Days". This allows for example to set a recurring pattern of "Repeat on 3rd Friday of every Month". With this version of SBSH Calendar we've added ~10 new setting items as well as fixed ~100 bugs that were previously reported upon in v1.4.02. This includes for instance the "New Item Settings" which centralizes all key component of a new item. Under there you can find stuff like "Meeting Duration" and "Default Show As". Status of a meeting is now color-coded and can be selected from the Leading Rect Color option in each view settings. We are positive that this made Calendar far better to use in terms of the user experience and the stability of the application. * Import/Export your settings - Users have been complaining for a long time that they can't import or export their settings (including colors and category colors' settings). Well, this is now possible with the new version under Menu->Settings->Options. The settings file is saved as c:\Data\Others\SBSH_Cal_Settings.ini. Mám problém. Najednou mi vše zmizelo z kalendáře. A SBSH šel podivně. Šlo ho zapnout, ale jakmile jsem tam chtěl něco změnit, tak psal, že se už používá. Tak jsem ho odinstaloval a opět nainstaloval. Opět nic. Nakonec jsem dal tuto novou verzi. Ta ani ho nezapne. Jen tam svítí SBSH Calendar a nic. Co teď s tím? Synchronizuji to v PC, kde mobil synchronizuji s Outlookem a zároveň pomocí programu Google Sync s Google kalendarem. Nevíte, jak nastavit, když z aktivního pohotovostního režimu vyberu modul (řádek)kalendář (ukazují se mi úkoly, či upomínky na blízké dny) a kliknu, aby se spustil SBSH Calendar místo integrovaného? Prosím o radu, začala mě zlobit synchronizace s Outlookem přes Nokia OVI suite (zkoušel jsem i PC Suite). Pokud vytvořím událost v SBSH, tak se mi "nepřenese" do outlooku, pokud událost vytvořímv interním kalendáři, tak synchronizace funguje. Pokud vytvořenou událost v SBSH,která se prve nesesynchronizovala otevřu znovu v SBSH a jakkoliv upravím, tak pak se již sesynchronizuje. Netušíte co by mohlo být za problém? Zkoušel jsem i reinstal za čistý SBSH. Synchronizaci barevných kategorií s Outlookem 2013 asi už nezískám. Má někdo zkušenost? Zatím jsem u handy kalendáře.